Fretted cello with active output. The NXTa Active Series Cello opens up new vistas for the cellist. Crafted in the Czech Republic by the makers of the renowned CR Series, NXT series cellos exemplify flawless workmanship at an exceptional value. 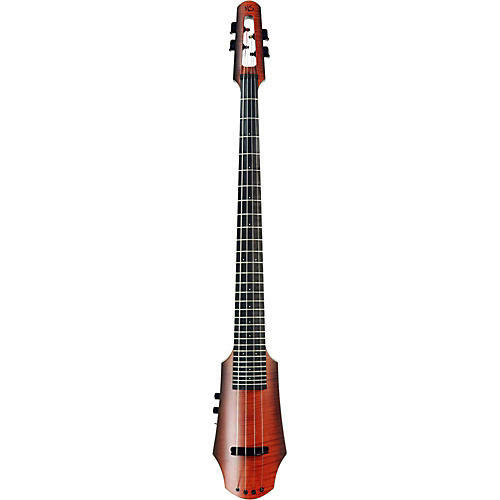 As a pure electric instrument, the NS cello has certain built-in advantages over an acoustic. One is the virtual absence of wolf tones, an unfortunate fact of life for the acoustic cellist. Another is freedom from feedback in amplified performance settings, which means the cellist can move about the stage at will, and better yet, can take solos at any volume. Since 100% of the sound comes via the pickup, using looping and other electronic effects in live performance is much easier and far more effective than with an amplified acoustic, where much of the unprocessed sound "leaks" out to the audience. Electronics & controls: passive circuit with high impedance output, no batteries required, volume control and tone control (treble roll off). NXT cello tripod stand: standard with the NXT, black painted steel, fully adjustable, self-standing tripod design. Folds for easy storage and fits into the NXT gig bag. Weight is 2.7 kg (6 lbs.). Order today and add a spectacular instrument to your tonal palette.